Constellation Cetus the Se Mosnter, is a southern constellation sitting below constellation Aries, between constellation Aquarius and constellation Eridanus. 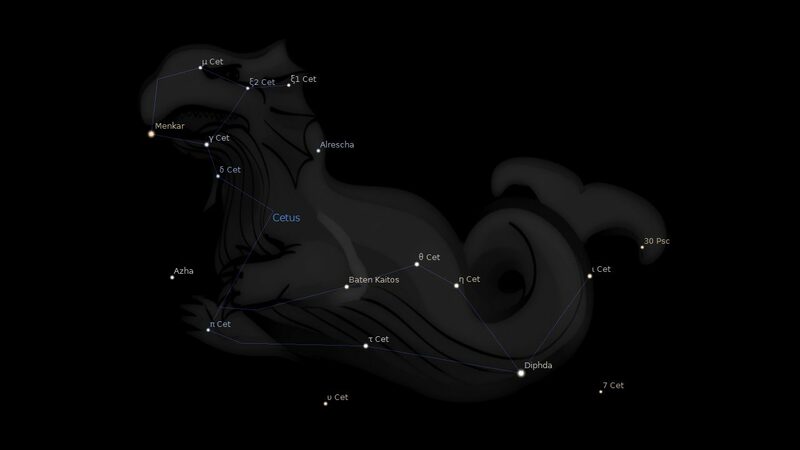 Cetus spans 50 degrees of the Zodiac in the Signs of Aries and Taurus, and contains 20 named fixed stars. Cetus represents the sea monster or whale sent by Neptune to devour Andromeda. Cetus, the Whale or Sea Monster… has been identified, at least since Aratos’ day, with the fabled creature sent to devour Andromeda, but turned to stone at the sight of the Medusa’s head (Algol) in the hand of Perseus. Equally veracious additions to the story, from Pliny and Solinus, are that the monster’s bones were brought to Rome by Scaurus, the skeleton measuring forty feet in length and the vertebrae six feet in circumference; from Saint Jerome, who wrote that he had seen them at Tyre; and from Pausanias, who described a nearby spring that was red with the monster’s blood. But the legend in which Cetus figured seems to have been current on the Euphrates long before our era; and, descending to Euripides and Sophocles, appeared in their dramas, as also in much subsequent literature. …in all delineations, it has been a strange and ferocious marine creature, in later times associated with the story of Andromeda, and at first, perhaps, was the Euphratean Tiamat, of which other forms were Draco, Hydra, and Serpens; indeed, some have thought that our Draco was Andromeda’s foe because of its proximity to the other characters of the legend. But as an alternative signification of the word ketos is Tunny,3 [This tunny, the horse-mackerel of the American coast and the Attacora thynnus of ichthyology, is found in the Mediterranean up to 1000 pounds’ weight.] also a signification of Khelidonias, applied to the Northern Fish of the zodiac, it is not unlikely that the latter figure should be substituted in the story for the time-honored Whale. As the last portion of the Fishes rises, appears the constellation of the Whale, pursuing Andromeda in heaven as on the sea. This monster enlists its sons in an onslaught on the deep and a butchery of scaly creatures; theirs will be a passion for ensnaring the deep with nets spread wide and for straitening the sea with bonds; they will confine in spacious prisons seals which deem themselves as safe as in the open sea and shackle them fast in fetters; the unwary tunny they will draw along in a network of meshes. Their capture is not the end, the fish struggle against their bonds, meet a new assault, and suffer death by the knife, and the sea is dyed, mixed with blood of its own. Furthermore, when the victims lie dead along the shore, a second slaughter is perpetrated on the first; the fish are torn into pieces, and a single body is divided to serve separate ends. One part is better if its juices are given up, another if they are retained. In the one case a valuable fluid is discharged, which yields the choicest part of the blood, flavored with salt, it imparts a relish to the palate. In the other case all the pieces of the decaying carcass are blended together and merge their shapes until every distinguishing feature has been lost, they provide food with a condiment of general use. Or when, presenting the very likeness of the dark-hued sea, a shoal of the scaly creatures has come to a stop and cannot move for their numbers, they are surrounded and drawn from the water by a huge drag-net, and fill large tanks and wine-vats, their common endowment of liquid is exuded upon each other, for their inward parts melt and issue forth as a stream of decomposition. This is what we see in the second section of the chapter, the second constellation in ARIES. 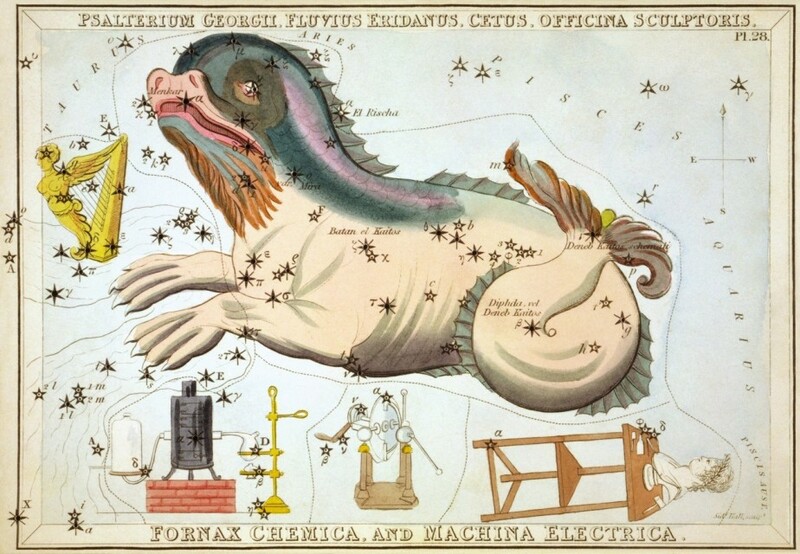 The picture is that of a great sea-monster, the largest of all the constellations. It is the natural enemy of fishes, hence it is placed here in connection with this last chapter, in which fishes are so prominent. It is situated very low down among the constellations–far away towards the south or lower regions of the sky. Its name in the Denderah Zodiac is Knem, which means subdued. It is pictured as a monstrous head, trodden under foot by the swine, the natural enemy of the serpent. The hawk also (another enemy of the serpent) is over this figure, crowned with a mortar, denoting bruising. It consists of 97 stars, of which two are of the 2nd magnitude, eight of the 3rd, nine of the 4th, etc. The names of the stars interpret for us infallibly the meaning of the picture. 1. Fixed Stars and Constellations in Astrology, Vivian E. Robson, 1923, p.38. 2. Star Names: Their Lore and Meaning, Richard H. Allen, 1889, p.160-161. 3. Astronomica, Manilius, 1st century AD, p.353, 355. 4. The Witness of the Stars, E. W. Bullinger, 26. Cetus (the Sea Monster).